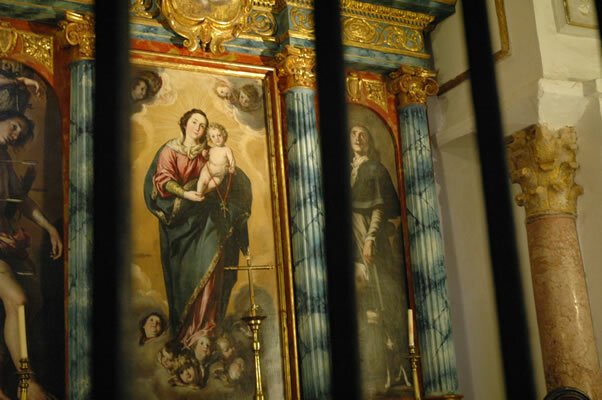 These altar paintings for Our Lady of the Rosary Chapel, in the Cordoba Mosque-Cathedral, are by Antonio del Castillo. They depict the Virgin Maria, Saint Roque and Saint Sebastian. Del Castillo was born in Cordoba in 1616. He was a follower of the painter Zurburan and later of Murillo. The chapel was founded in 1669 by Don Pedro Bugeda y Bonilla, and is the fourth chapel to the left of the exit on the north wall.